Using an oval shaped ball to play games. Sometimes the person marking the ball would be called King of the Pack. This is basically a game of Rugby without the tackling. Someone kicks the ball off, then everyone tries to grab it and run. When the person with the ball is tagged, he has to let go of the ball. These boys were playing with an AFL football. One boy said that they 'basically play with any rugby-shaped ball'. Also played by Age: 1 boys, sometimes called Tap Rugby. This game was played on the Junior School Oval (Map Ref: A) - predominantly on the half of the oval towards Map Ref: G. The start of play is around the centre of the oval. The player with the ball starts play and begins, generally with a small kick of the ball to himself. This may in fact be just holding the ball and touching it with one foot. This player then with ball tucked under his arm, starts running towards the touch line denoted by the edge of the concrete apron Map Ref: G. He is chased and tries to elude opponents by evasive moves. The opponents try to touch or tap the player whereupon the possession of the ball goes to the successful 'tapper' or 'toucher' who then repeats the same moves in trying to reach the touch line. When the line is successfully reached the ball is quickly 'touched' on the concrete surface as a 'winner'. There appears to be more individual play rather than team play in this instance. Some boys would also play kick to kick - AFL style. Although there were only two of them and were well aware of the enormous shortfall of players, they had a genuine rugby league shaped ball and were therefore playing rugby league football. They carried it around for a while and I was unable to determine whether they were seeking or waiting for other players to arrive. Unfortunately, due to the bell sounding, I was unable to watch them at play. Never-the-less, I came to the conclusion that there was to be a degree of make-believe, in that many of the opponents were going to be imaginary. The game may have included a slightly larger degree of 'hero worship' than a desire to actually play the game. I was unable to quiz the boys about this, however one of the boys was much larger than the other - they were not evenly matched. A single boy was observed kicking the football around on his own. Year 3. Touch football on basketball courts. Boys playing soccer and football on the soccer field beside the main oval. Other groups of boys and girls standing around talking at the edge of the field. 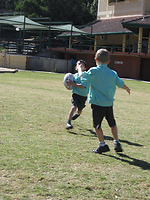 Kicking goals through AFL goal posts on oval using 'full' size football. No tackling or bumping allowed.